Prague has been on my bucket list for a while. It's a city I’ve always been curious about with its contrasting cultural and historical significance and its reputation for riotous stag weekends. We came with mixed views and expectations. Much of our research had drawn a blank with the exception of clearly well-trodden tourist attractions and some slightly more salacious offerings. The reality was quite different. A city of surprises where culture vultures were as at home as the revellers. Where around each corner was something new. A place where our time was there for us to enjoy exploring and each other. My husband booked Prague as a surprise gift for Christmas. A new adventure for us both so we could spend some quality time together and have a break from our busy lives. It turns out this was the best place for the latter - it’s a great city to wander and just hang out. There’s lots to do in Prague but not an overwhelming amount. You won’t have to set your alarm at 7am and have a packed itinerary in order to fit everything in like you would in New York and Berlin. Instead you can have lazy mornings and aim to see a couple of tourist attractions a day with the added bonus that it can all be done on foot. It’s not very big so it’s a great way to get lost in the streets and discover the city. Prague is home to some of the best-kept architecture in all of Europe having been spared from being bombed during the war and the Soviet invasion. Today it's a timeless city that is a major attraction for hoards of tourists year in and year out.Prague's maze of cobbled lanes and hidden courtyards is a paradise for the aimless wanderer – always beckoning you to explore a little further. Just a few blocks away from the Old Town Square, you can stumble across ancient chapels, unexpected gardens, cute cafés and old-fashioned bars with hardly a tourist in sight. One of the great joys of the city is its potential for exploring and finding great neighbourhoods such as Staré Město - where we always found ourselves being pulled back to. In the Old Town one day we discovered an amazing antique store called Bric à Brac where we came upon the wonderful, charismatic owner Miloš. His shop is an Aladdin’s cave and he’ll happily feed you brandy, coffee and cake whilst you browse through his treasures. It’s here that we soon realised why Prague is famous for its lead crystal. I’ve never seen such beautiful Art Deco pieces – we could have spent thousands. We reluctantly controlled ourselves and bought one beautiful souvenir. You can see it below on our bookshelves sitting like a sculpture and waiting for a dinner party. Prague is worth a visit alone just to stock up on crystal. Prague also just happens to have some of the best beer in the world. Since the introduction of Pilsner Urquell in 1842, the Czechs have been famous for producing some of the world's finest brews including the original Budweiser. Never before have Prague's pubs offered such a wide range of ales. Another great excuse to stop and take a break. And if you you have more of a sweet tooth, then you must try one of the local delicacies Trdlo. They're a cross between a doughnut and a cornet filled with pretty much anything you fancy. You cant miss them as they’re on every street corner. One of the things that did surprise us and I’m not too sure why, was the quality of food. 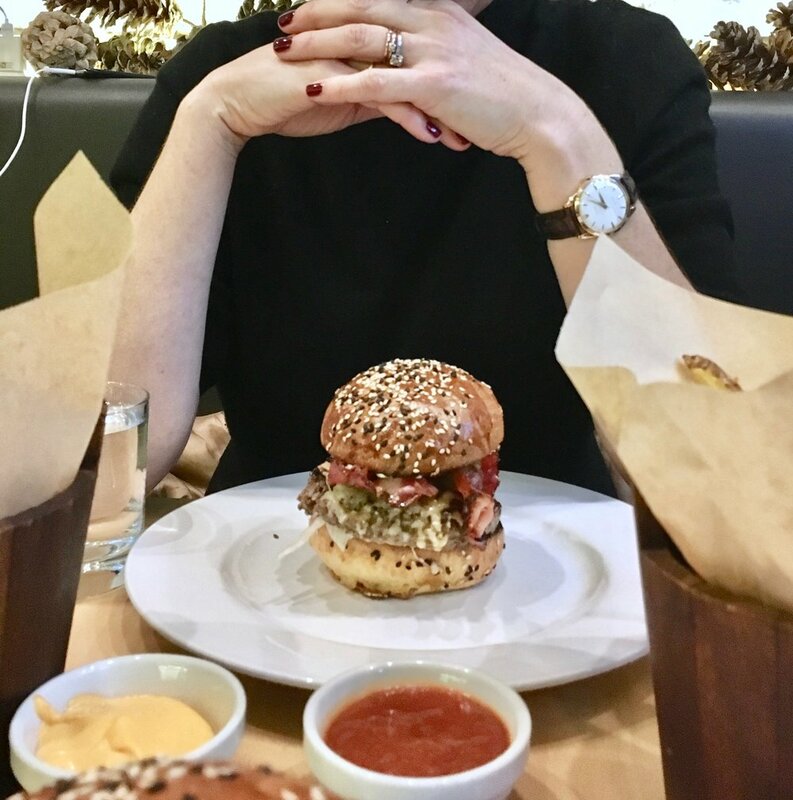 Now usually I always stick to authentic cuisine - 'when in Rome' and all that, but unfortunately it’s a very meat-orientated diet and I’m not so meaty. We tried every kind of restaurant from local cuisine to Japanese and it was all great value for money and delicious. I think the burger from Meat and Great and the Japanese from Asian Temple was some of the best food I’ve tasted. You can see our favourite restaurants and bars at the end of the blog. We weren’t quite so sure what to expect with the nightlife, given its reputation for stag and hen parties. Again we were shown that Prague has lots of surprises. We found great bars - grungy pubs, swanky cocktail bars and cool absinthe bars. The latter had to be one of the highlights of our trip. 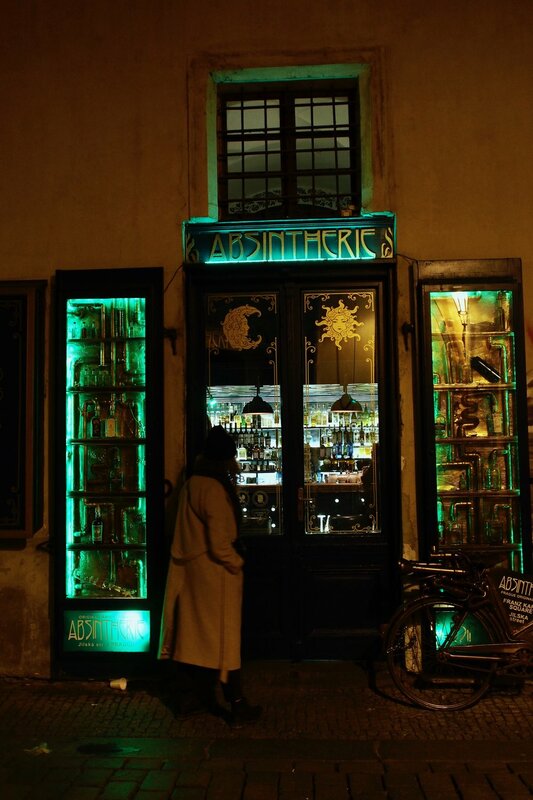 We found the Absintherie hidden down a back street. It's an unusually chic bar that felt like you were stepping back in time. The cocktails tasted amazing and kick-started a very fun night! Now down to the must-see. Each day we planned a tourist attraction to aim for. There's so much to admire that I guarantee you too won’t be disappointed in them. Charles Bridge is Prague’s most iconic bridge is an essential first stop for any first timer. This spectacle of a 14th-century stone bridge is stunning. It’s always extremely busy but the views are so breathtaking that it doesn’t really bother you. Prague Astronomical Clock is on the other side of the bridge is the Old Town and Prague’s famous Astronomical Clock. Be sure to stop by for some tourist snaps but beware of the overpriced tourist haunts located in the square that offer far from the best food in Prague. St Vitus Cathedral is another city icon. St Vitus Cathedral is a favourite for many visitors to Prague due to its unique baroque architecture. The walk up to the cathedral is a sight to be seen. It’s quite a climb but worth every breath as the views are incredible. Keeping in the Art Deco theme we decided to stay at The Art Deco Imperial Hotel. As the name implies, one of this property's biggest strengths is the masterful Art Deco interior. Expect porcelain tiles made by Czech master craftsmen, bronze figures, and stained glass. 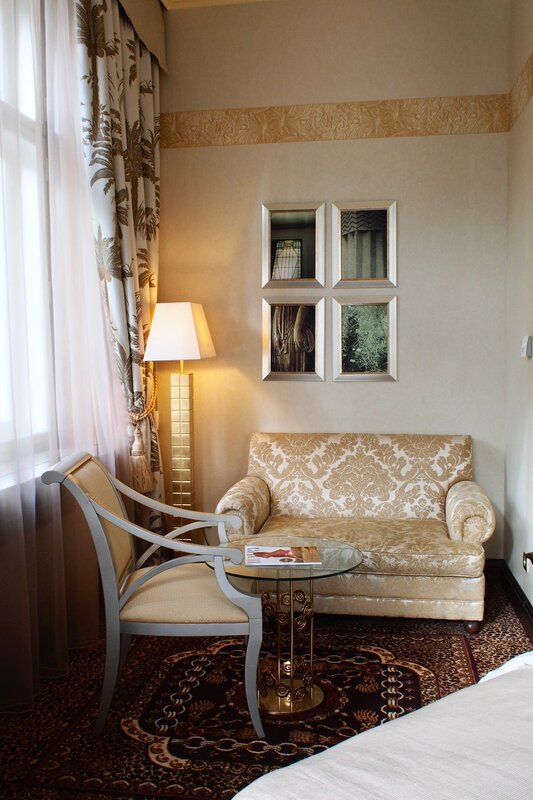 Bedrooms feature grand beds and high ceilings, service is efficient, the staff are friendly and the restaurant is excellent. Possibly one of the best breakfasts I’ve ever had in a hotel. This is pretty much how Prague revealed itself for us. We came here with preconceptions and yet the reality was very different – in a good way. We had such a wonderful time in this great city. It may not be somewhere I need to return to with so many places to visit in the world but I would recommend Prague without hesitation.